This entry was posted on November 6, 2007 at 3:43 pm and is filed under art, bookplates, books, doodles, ex libris, free art, free stuff, illustration, jaggedsmile. You can follow any responses to this entry through the RSS 2.0 feed. You can leave a response, or trackback from your own site. Did Kristi coach you about the acid free paper and the library grade glue? Where do you get library grade glue? How fun, fun, fun. Thank you! My favorite bookplate in my memory was an old one my sister had a few of when we were littler…they were esoteric, besuited and bespectacled rabbits in a crammed British-looking personal library. Sorry…guess I did use a rather stilted phrase when I could have just said “make sure your glue is acid-free as well”….I’ll edit that part. Wow! It’s truly an honor that you consider my doodle even the least bit worthy to stand alongside the beautiful pieces you have on your blog. I appreciate your support, and the labor of love your site obviously is for you. Thanks very much! I will use it on my books. We took the liberty of using your drawing in a reading project for schoolchilderen in Holland. The EU is sponsoring a series of ex librisses. We do not make no money out of it, but your drawing will be distributed among 13.000 pupils! 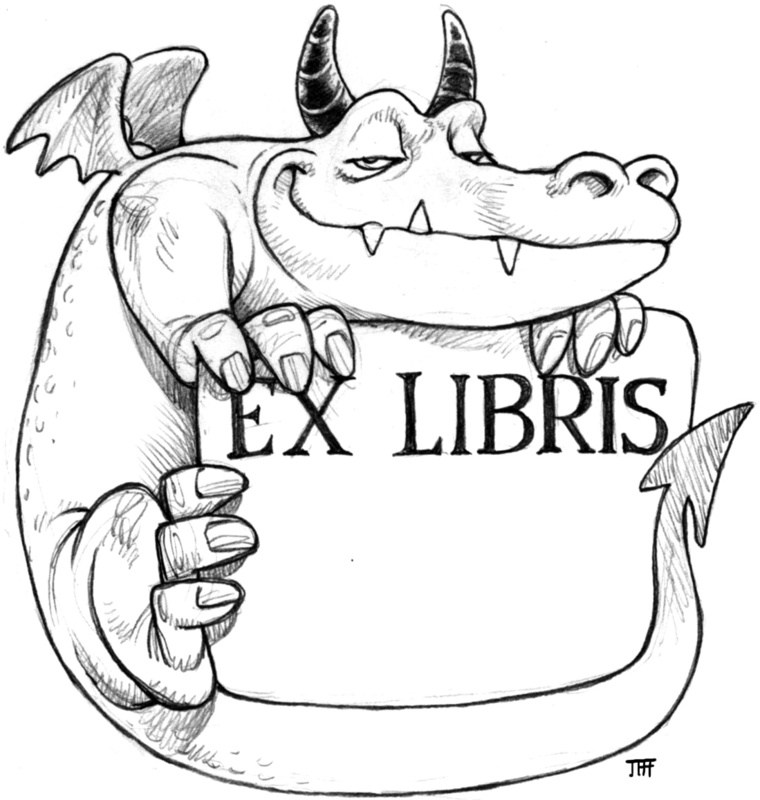 If you like, we can send you a Pdf of the ex libris we made with your drawing and a Pdf of the pages from the workbook of the pupils in which we explain the purpose of an ex libris. Wow, Peter! That is so cool! I’m really honored. I’d love to see what the kids do with my illustration. Thanks! At the risk of coming through as ignorant, I have to ask: what’s the purpose of acid-free paper and glue? Does it in any way contribute to the deterioration of the book in question, or is it just being greener / non-toxic? It’s not an ignorant question at all. The reason for suggesting acid-free paper and glue is to protect the book and bookplate. Acids, over a prolonged period, can literally burn the paper (no, not “bursting into flames” burning…but is does turn it brown and make it brittle). Most books are printed on acid-free paper, and bound using acid-free adhesives. I’m not aware of any green benefits, but it would stand to reason there might be some. Thanks for asking. Hope you enjoy the ex libris. Thanks a lot! I was wandering about the very effect you explained. printed word and printed picture! I would like to be a part of this exchange!